In 12-inch nonstick skillet, cook bacon until crisp; drain on paper towels. Crumble bacon; set aside. Reserve drippings in skillet. Cook apples and gingerroot in bacon drippings over medium-high heat, stirring occasionally, until lightly browned and tender. Stir in brown sugar, thyme and salt. Cook 1 minute; stir in apple juice. Cook 1 minute; remove from heat. Cool completely. Heat oven to 450°F. Place baguette slices in single layer on ungreased cookie sheet. Brush with 1 tablespoon of the oil. Bake 3 to 5 minutes or until toasted. Turn slices over; brush with remaining 1 tablespoon oil. Bake 3 to 5 minutes longer or until toasted. 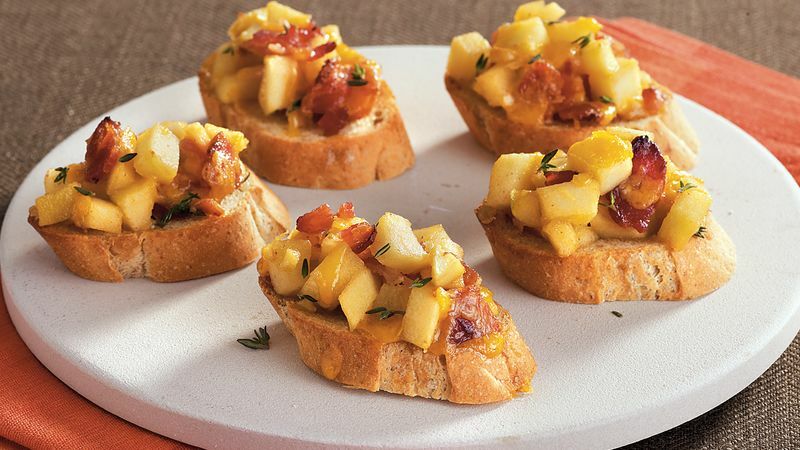 In skillet, add cheese and bacon to apples; toss. Place about 1 tablespoon apple mixture on each baguette slice. Bake 5 minutes or until cheese is melted. Garnish with thyme sprigs. Serve immediately.